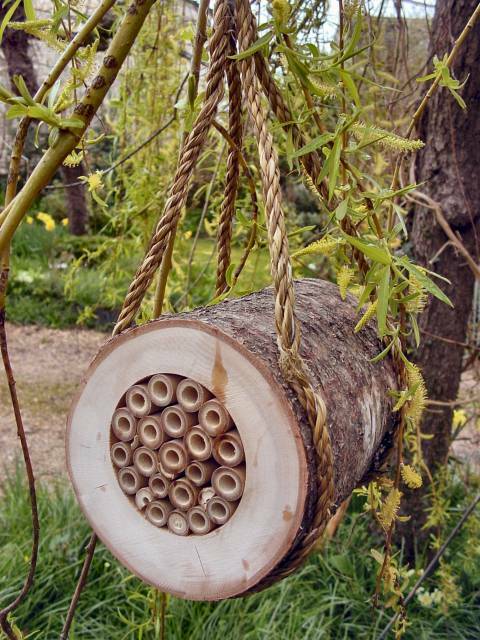 This range of insect habitats are designed to add attractive features as well as valuable habitats to a garden. 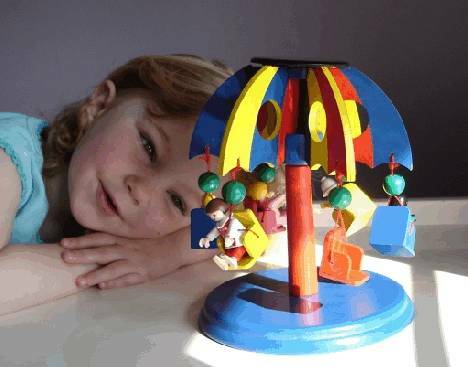 Produced by a company based in the heart of the English countryside they are constructed almost entirely from sustainable natural materials. Most of the wood used in the construction of our insect houses is produced under the FSC scheme or from offcut/waste wood. These products are treated with water-based finishes instead of solvent-based paints and stains. 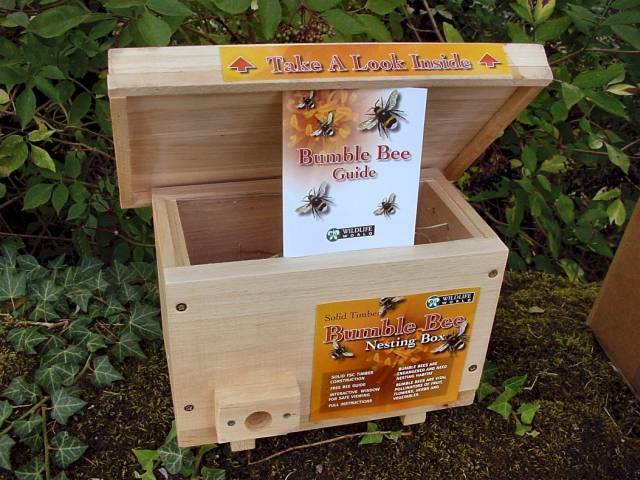 Bumble Bee Nester - complete with full instructions, Bumble Bee Guide, Internal viewing window. 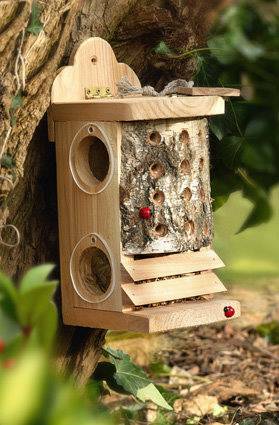 The Bee Nester is constructed from thick durable timber (Cedar/Larch/Pine). It is very important that nesting bees are kept dry. There is a fully hinged (solid brass to prevent corrosion) overhanging green felted roof which can be opened to reveal an internal viewing window (removable). Vent holes are provided for good air flow. The floor runners help lift the box and reduce moisture. 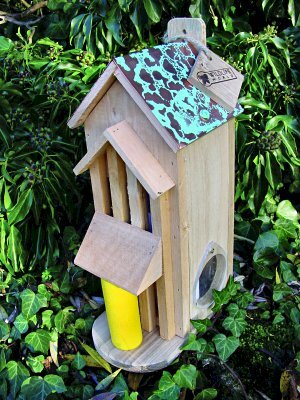 Nest material/instructions and excellent Bumble Bee Guide are included. 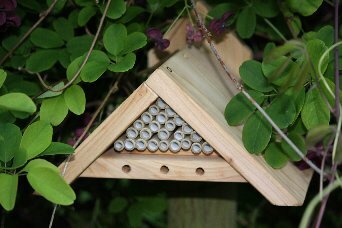 SOLITARY BEE HIVE WITH INTERACTIVE S/S BOLTS (Bee guide available seperately). 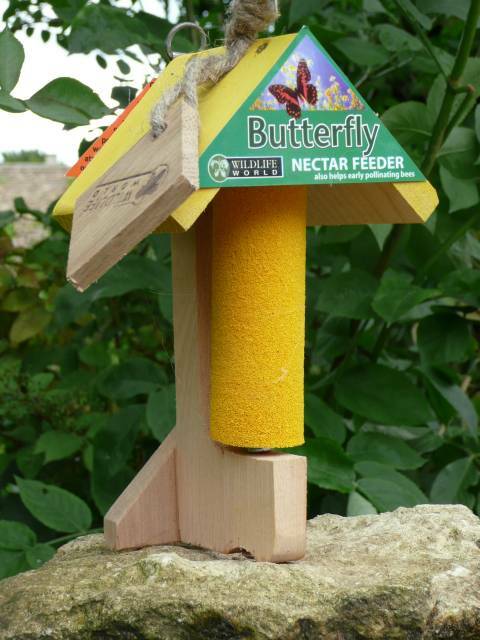 The central feed sponge can be charged with a sugar/water solution to encourage and help butterflies or it can be soaked with Butterfly Attractant to encourage colourful butterflies (with the exception of the Cabbage White) to the feed station. The following butterflies may be regular visitors to the feeding station (depending on the area / site) Small Tortoiseshell, Peacock (often found in sheds and outbuildings) and the Comma Butterfly. Less commonly, the Silver Winged Fritillary may use the feeding station (preferably sited near mature trees). 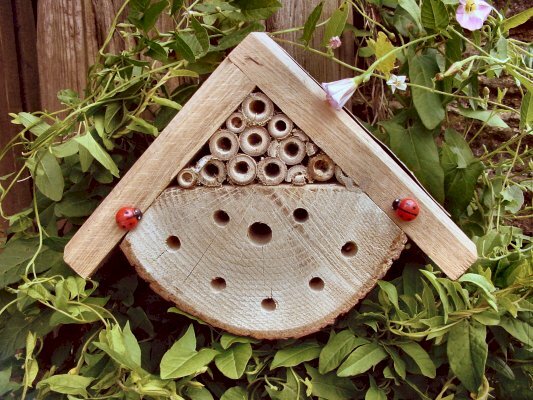 Ladybird / Lacewing Log - This natural habitat made from chunky FSC Certified Timber and natural log is an ideal habitat for Ladybirds and Lacewings. Both of these insects are valuable natural predators of garden pests like aphids and greenfly. 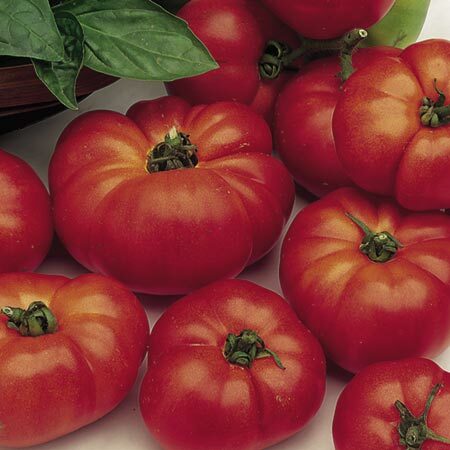 Encouraging these insects will help reduce or eliminate chemical insecticide use in the garden. The internal chamber can be filled (through the viewing ports) with straw (Lacewings) or bark (Ladybirds and other insects) to provide valuable insulated over wintering space and summer retreat. 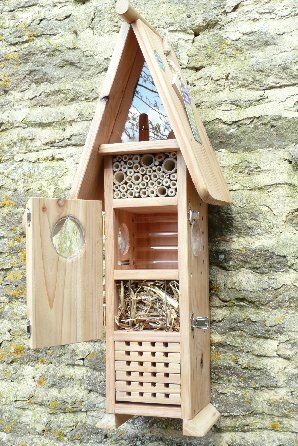 Beneficial Insect Box - This solid insect habitat provides space for many beneficial insects, including solitary bees (helping pollination and fruit yields) and is a well insulated over wintering space for ladybirds, lacewings etc (natural predators of Aphids in the season). 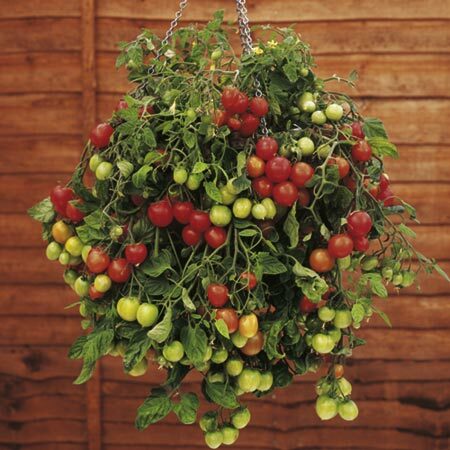 Site in a sheltered spot near scented plants or a pond, preferably to catch the morning sun. 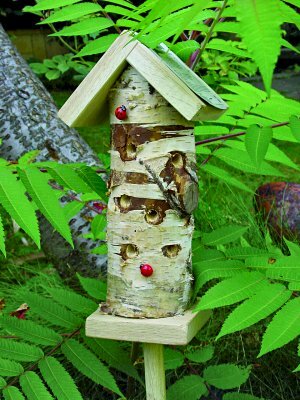 Attractive additon to the natural wildlife garden this Silver Birch pollinating log will attract helpful and friendly bees to your garden. This Pollinating Bee Log is the natural home for Mason Bees and other Solitary Bees as well as a variety of over wintering insects. 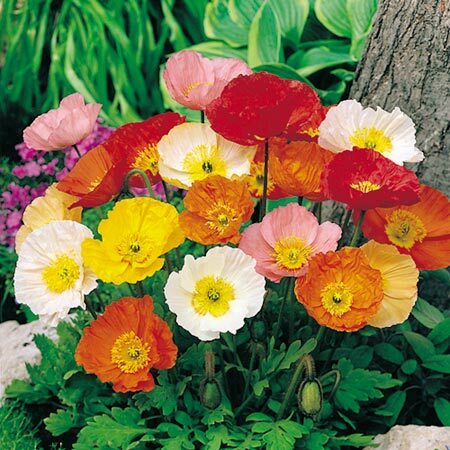 Vital for pollinating fruit, vegetables, herbs and flowers, these bees are non swarming and non aggressive and are safe with children and pets. 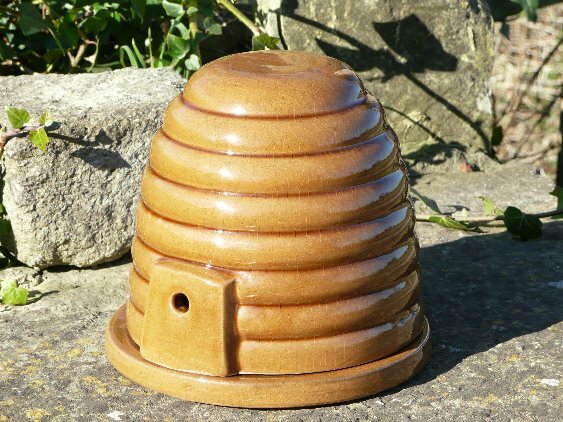 The Log is designed to give good insulation (does not require moving inside in winter) and is filled with natural nesting tubes for the bees. SITING - The Log can be hung on a wall or from trees, pergolas or pole systems with the special strengthened seagrass hanging ropes.